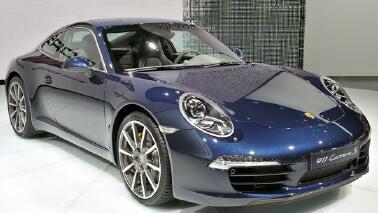 The 2012 911 Carrera S was a star of the Frankfurt Auto Show. It's an exciting time of the year for car people (that's us!) when manufacturers bring out their best offerings, including new models and concepts. The Frankfurt Auto Show is already in the books. More to come in Europe, North America and beyond. Meanwhile, back here in the Milwaukee Region, PCA is still rolling with some social events. The Oct. 15 drive to breakfast combines a short drive with a destination for breakfast in Delafield. The Oct. 20 dinner takes us back to Delafield (is there a trend here?) for a casual get together at a relatively new restaurant. Our calendar is quiet for November but in early December, Dec. 3, we are getting together for a holiday party. It's been a few years since we had a holiday party. Sharon Stewart, a member of the region's Social committee, took it upon herself to plan a great evening for us. You can dress up or down. Join us for all of these events. Details are noted below with deadlines and instructions on how to RSVP. This issue also includes profiles of some new members, a recap of the Fall driving tour, and more. Downshift and read on. Oct. 6 - Board meeting. Members are always welcome. Pull up a chair, order a beverage and listen in on the meeting. 6:30 pm start time. Wisconsin Club Country Club, N. 60th & W. Good Hope Rd., Milwaukee. Oct. 14 - Drive for Babies at Road America. Details here. Courtesy announcement. This is not a PCA event. Oct. 15 - Autumn Color Peak Drive to Breakfast -- Immerse yourself and your Porsche in the fall colors of SE Wisconsin as tour guide Al Wagner takes us on a nondirect route to Delafield for breakfast at Andrew's Hotel. Details here. Oct. 20 - Casual dinner at Tony & Mia's in Delafield. This is a mid-week getaway. Jump in the Porsche and join us. Details here. You must RSVP by Oct. 10. Nov. 3 - Board meeting. Members are always welcome. Pull up a chair, order a beverage and listen in on the meeting. 6:30 pm start time. Wisconsin Club Country Club, N. 60th & W. Good Hope Rd., Milwaukee. Dec. 1 - Board meeting. See above. Dec. 3 - Holiday Party. It's back, our region's holiday party. Dress up or dress casual and join us. Bring a guest. Meet new friends or reacquaint with members you've seen at other events during the year. This will be the region's final event of the seaon at the relaxing setting of the Copper Dock. Details here including RSVP requirements. Looking back on the season we had a lot of great events to enjoy and we’re not done yet. I unfortunately was unable to attend most of them due to work and other obligations but I did read all of the recaps on our great web site and once again they were all deemed fun and enjoyable by everyone that attended them. We still have a few events coming and I encourage you to check the web site calendar often and early so you can plan to join us in the fun whenever and as often as you can. I would also like to encourage all members to send a message or talk to one of the Board or Chair members if you have any ideas for next year. You can express your input in a number of ways. One, join us at any board meeting. The board is a friendly group. We want members to sit in on the meetings and your thoughts can be shared with the decision makers of the region. You elected them. They should know what you suggest. If you can't make a board meeting (first Thurs of every month, 6:30 pm, Wisconsin Club Country Club - 60th and Good Hope), send an email to or call any board or chair member. Their contact info is on the Contact Us tab of the region website, www.porschepark.org. This region is yours - let us know what you want to do! Better yet, join one of the committees. Speaking of the region, I’ve had a few folks ask how we are doing in this economy and I’m very happy to say we are doing great! Membership is holding steady, at times we even added a few new members which is always a fantastic thing to see. Financially the region is stable even though member activity was down a little this year but I suspect this will pick up again next year. Now get out there and enjoy the colors and remember; it’s not just the cars it’s the people. We also welcome Michael Ross of Verona, Wis., who transferred to our region from the Central Wisconsin region. Michael drives a 2006 911. Thanks to these new members who shared their stories about Porsche ownership. Any member, new or long-standing is invited to share the details about their cars. Send a note to Steinlifters editor Beverly Jurkowski. Christian Lee and his 2012 GTS. Christian Lie motors into our region in his 2012 Porsche GTS. It’s Guards Red and he purchased it this past summer. Chris is president of Risk Services at Diversified Insurance in Waukesha. 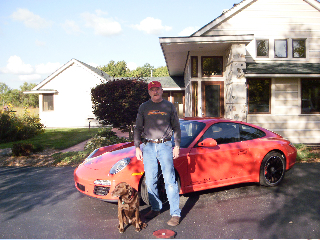 He planned to introduce his Porsche to the track on Oct. 1 at Blackhawk Farms. 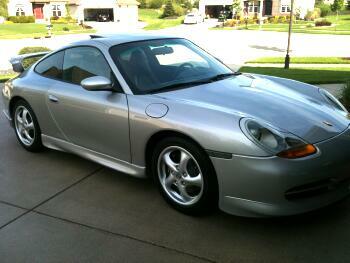 Karen and Marty Gnatzig are enjoying their 2001 Boxster S, with 27,000 miles on it. They’ve owned it for a little over two months. They shopped online and found it at a dealership in Madison. Marty is no stranger to Porsche. In the late '60s he drove a 1960 356 Roadster and also had a 1965 SC Coupe. “Now, 40 years later, we’re enjoying Porsche again,” he said. Karen and Marty have been married for 43 years. Marty operated a service station, car wash and auto repair shop for 35 years before retiring. He’s looking forward to trying all of the region’s event at one time or another. Phil Harding is the third owner of a 1999 Boxster with about 88K miles on it. He’s had it for two years. “I just happened to see the car sitting on a used car lot and bought it on a whim,” he said. It’s mostly stock but he added an aftermarket spoiler, a 996 instrument pod, HID headlamps, and a few other tweaks and has plans for additional performance tweaks.” I’ve had sports car (mostly Z-cars and Porsches) most of my driving life and this is my fourth Porsche. My first Porsche was a 944. I traded that for a 944 Turbo which I drove for a few years until I totaled it. After the 944 Turbo I bought a 911 Carrera (big whale tail and all) that I kept for six years, and now the Boxster,” he said. Phil retired from PPG Industries two years ago after 37 years working as a product development chemist and laboratory manager. He’s particularly interested in driver’s ed events, autocross, regional tours, and tech sessions – as he does almost all of his own maintenance and repairs. Greg Fiebig says he is excited to become a new member of the PCA-Milwaukee Region. He owns a Silver 1999 911 C2 Aerokit Coupe. It has manual transmission, full a FabSpeed exhaust system and silicone intake sleeve. The C2 has black leather interior and just 43,000 miles. It’s in pristine condition. Greg says it is not his daily driver, "just my occasional weekend excitement machine.” Two years ago his quest to find a 911 ended when he bought the C2. He was looking for more than two years. Of the 911, he said, “I wanted one since I was 12, and finally found the right one on Craigslist in Chicago, from a private owner, through his Porsche mechanic. “This is my first Porsche, but definitely not my last!” Greg owns a company called AirCraft Image Inc., an aircraft detailing company that serves private and corporate aircraft. We can expect to see Greg at Road America driver’s ed events, tech sessions, dinners, social events and concours d’ elegance and car shows. Read about the Fall tour in this article by roving reporter Al Wagner. Read here. The Cars & Coffee concours in September was a special event to coincide with the city of Lake Mills' anniversary celebration. Read an article here by roving reporter (and a concours winner at this event!) Donna Daufenbach. Read here. This is the regular column in which we provide technical tips for those do it yourselfers among us or for those who just want to be better informed when they take their car in for service. This month's tip is about how and when to check oil in an aircooled 911. This is a task that is often done improperly -- and not just by owners. It is best to check the oil in your aircooled 911 when your engine is running and fully warmed up. Your Porsche should be at operating temperature -- running for at least 15 minutes or more, longer in cold weather. Let the hot engine idle for 60 seconds. This allows the oil to settle for a more accurate reading. Then take the reading. Dashboard oil gauge should read between a third and two thirds full. The dipstick should reflect the level that is on the gauge. Add oil as required. Caution: There is less than two quarts between the "full" and "empty" marks on the stick. Add no more than 1/2 quart at a time. Don't panic and overfill. Too much oil is not a good thing. After a drive is a good time to check the oil. Porsche noted as one of the 10 fastest cars for 2011. Read the CNBC article here. Enjoy this video of Porsche piloted by one of the region's favorite professional drivers. View here. Porsche Cars North America announces it is building a new headquarters. Read the news here. Porsche races at Nurburgring, a legendary track. Read the details here.